Three centuries of Bengal’s history blend in to the ethos of Balakhana. French in its architecture, and built in the late 18th century as a Neel Kothi or ‘Indigo House’, Balakhana was the residency of an indigo plantation that surrounded it. Indigo was the prime colonial cash crop of the time, but its forced cultivation, which was the British practice, caused a peasants’ uprising in 1859. With force being banned by the British Government in 1863, indigo lost ground, even as jute and tea became the new colonial cash crops. By the 1870s Balakhana was put up for sale by its then owner, Henry Nesbitt Savi born 1832 in Balakhana, an Englishman, and bought in 1875 by its present owners, the Palchoudhuris. Wealthy traders of the 18th century, the Palchoudhuris became prominent landowners in the 19th, and went on to build a new fortune as pioneer Planters of tea gardens, still owned by the family and flourishing till this day. 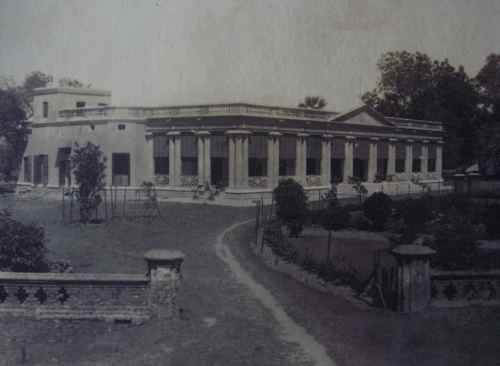 Balakhana came into the family in 1875 when Nafarchandra Palchoudhuri, a prominent landowner, first President of the Bengal Landholders’ Association of the day, bought the property for his brother Bipradas, who was then a student of engineering in England and had seen an advertisement for it. Upon returning home, Bipradas built a life that spanned Balakhana in Maheshganj, Calcutta, and Darjeeling in North Bengal and Assam, where he became an intrepid pioneer Planter of tea gardens : Tindharia, Mohurgong, Rani, Belgacchi, and Gayabari. He would supervise his gardens by riding alone through dense and dangerous jungles on a 2 wheeler horse driven carriage, changing horses at every stop to cover the terrain faster. A public minded man and a patriot, Bipradas was a member of the Indian National Congress, a member of the Nadia District Board, and a many sided contributor to the community of Maheshganj. Besides helping to build the Sadar Hospital and the District Cooperative Bank, he was a prime mover behind the Krishnagar – Jalang light railway service. A far sighted man, observing the Jalangi change its course and threatening Balakhana, he built a 800 metre embankment which in time made the river swerve away. On Bipradas’s death in 1914 in England, where his ashes are buried, the Maheshganj estate with Balakhana went to his youngest son Ranojit, in a dispensation that divided his tea estates and his zamindaris equally among his 3 sons, the others being Manmatha and Amiya. Divided only on paper, the Palchoudhuris continued to run as one family. For many years, Amiya, the middle son, managed the tea gardens; the mantle passed to his eldest son, Amitava, who similarly oversaw the gardens, but also led the family into manufacturing. In Maheshganj, Ranojit followed in his father’s footsteps. He donated the land for building a technical training institute, the Bipradas Palchoudhuri Institute of Technology, and also for the Primary Health Centre and the Primary school of Maheshganj. He served as a Member of the Bengal Legislative Council for 3 terms from 1928. As a Member of the Union and the Railway Boards, he led the way to the starting of a narrow gauge track that connected Shantipur, Krishnagar and Swarupganj, also connecting three ends of his estate! Biprodas’s adventures in the jungles of the North while setting up his tea gardens, found an echo found in Ranojit’s exploits as a prize winning pilot at the Bengal Flying Club. It showed too in his passion for hunting, never cats, but whenever called upon, marauder crocodiles in the Sunderbans. Just outside Balakhana, Ranojit laid out a short landing strip for the Tiger Moth he used to fly – once flying in Subhas Chandra Bose for a Congress rally in the District. Ranojit treasured his sojourns in Balakhana and it is to him that Balakhana owes its orchards; and to his wife Renuka, its flower gardens. Though Balakhana was bequeathed to Ranojit and remains in the hands of his sons, it continues to be a homing ground for the children of his brothers, and their children; the progeny of Bipradas Palchoudhuri, traversing a new era in time. Documentary on Indigo; cultivation and trade in erstwhile British India. This video very briefly & accurately depicts the cultivation, trade & economics of Indigo, in India – the much sort after ‘Neel’ or ‘Blue’ (colour or dye) – especially during the bonded or forced cultivation period of British colonial times. The wrath, hatred & fear of the local farmers have been aptly portrayed in the excerpts from the play ‘Neel Darpan’ ( A Mirror to Indigo ). Ms. Subhra Mukherjee of S.S. Productions, directed & created this documentary on behalf of The National Council of Science Museums.